Data published this week showed that the Czech Republic’s unemployment rate was a mere 2.9% in June , compared with 3.8% in Germany and 7.7% in the European Union overall. So how does this former communist country do it? Firstly, and perhaps unsurprisingly, labour is cheap. The average hourly labor cost in the Czech Republic in 2016 was just €10.20 ($12.07), well below the EU average of €25.40. But this doesn’t fully explain the country’s low unemployment because others like Bulgaria, Hungary, and Poland, have even lower labor costs. 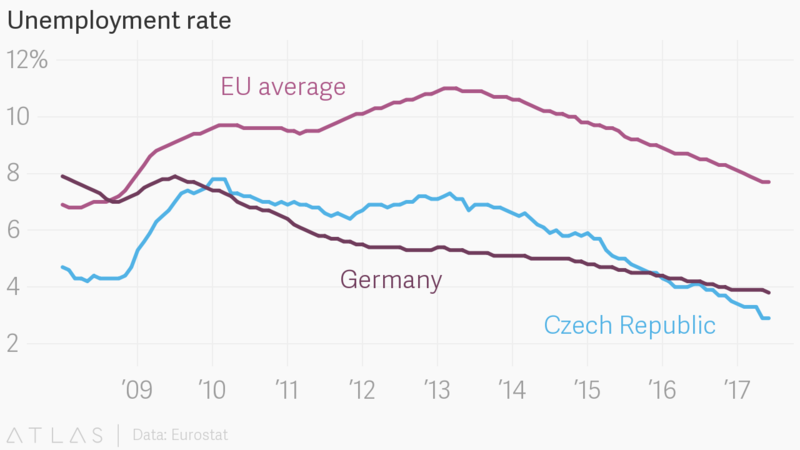 Also, wages in the Czech Republic have been rising pretty steeply. In the first quarter of 2017, nominal wages increased by 5.3% , or 2.8% adjusted for inflation. Marek says the country can’t afford wages to increase faster than productivity. The Czech Republic is “the assembly center of Europe, not the knowledge center,” he says, meaning it has a lot of inexpensive, low-skilled jobs but isn’t developing the skills and knowledge to meaningfully increase productivity with more sophisticated processes. To keep unemployment low, the government needs to change its decades-old incentives system to encourage the creation of high-skilled jobs, namely by improving the education system. While there is a high rate of secondary education , relatively few people go on to get university or vocational qualifications.